What’s Dale Earnhardt Jr. going to do next? He’s going to Disney World! 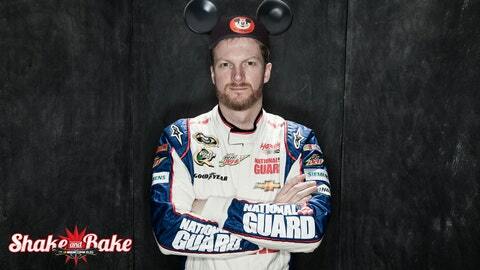 This is what Dale Earnhardt Jr. would probably look like after a trip to the souvenir stand. It’s good being Dale Earnhardt Jr. Real good. NASCAR’s perennial most popular driver has a busy off-season planned, with some fun events on the itinerary, including a trip to Disney World in Lake Buena Vista, Fla., with sister Kelley Earnhardt Miller and her family. "I’m going to take my sister and her kids and L.W. (Miller, Kelley’s husband) to Disney World and just spend a day letting the girls drag me around and see how much fun they can have," said Earnhardt. "I look forward to that. I don’t get a lot of time to spend with them, so that’ll be a real important week." Earnhardt said he’s not worried about drawing a crowd. Instead, he figures the 25,000-acre entertainment complex is so big, he’ll blend in easily. "There’s so much going on. I’ve never been," said Earnhardt. "But I’m assuming that that place is so overwhelming that I definitely won’t be the main attraction. I could probably get lost in that place without a problem." The best part of the trip? "I think just being with my nieces and enjoying what we want to enjoy," he said. "I’m looking forward to that." On top of that, Earnhardt will do the pre-game coin flip at the Tax Slayer.com Gator Bowl on Jan. 1, a college football game in Jacksonville, Fla., between the Nebraska Cornhuskers and the Georgia Bulldogs. Also on the docket are a trip with girlfriend Amy Reimann to visit her family and a weekend in Ashville, N.C., that Junior won during a foundation raffle in the middle of the 2013 season. Then again, it’s not too long before the engines will fire up again at Daytona Speedweeks, so he better get his fun while he can.